Most residents remain in care until 18. If the resident has disabilities, they may stay until 21. Many residents exit the program prior to that time as a result of: reunification, independence, termination, absence from the program, or placement change. It is the goal of the Whitmarsh Program to positively conclude services for each resident as a result of having attained the treatment objectives outlined in the service plans. Reunification with family may be an option open to a resident when that outcome is a favorable one for the family and the resident. Before reunification can take place all parties along with DCYF and the Family Court, must agree that circumstances warrant reunification as the best outcome to meet the needs of the individual in care. Reunification may extend to include other family members beyond the nuclear family unit. A date is set for the resident to return home after having completed a transitional period of gradually extended visitation. Provided there are no problems or adjustment issues, reunification is accomplished and the residence is ended at Whitmarsh. At the age of eighteen a resident who has demonstrated the ability to meet his needs in providing for food, shelter and sustained employment may be considered an independent individual no longer in need of services. As such, the individual is assumed to retain all of the rights, privileges and responsibilities given to one of majority status. A final decision regarding independence may rest with DCYF and the Family Court in some circumstances where the resident may not be able to function as an independent person. The goal of this program is to provide services to youth recently discharged from a Whitmarsh site to help them return and remain in their home environment. The program provides structure, support and supervision to youth and their families. The aim is to expedite more positive discharges of residents and a lower recidivism rate. Discharge from the after care program will occur once all parties involved (youth, family, Whitmarsh staff and DCYF caseworker) have determined that the youth and his family have met the criteria set. The anticipated length of involvement is three to six months. The staff at Whitmarsh House work with the Rhode Island’s Department of Behavioral Healthcare, Developmental Disabilities and Hospitals (BHDDH) programs to help secure job placements for our residents. 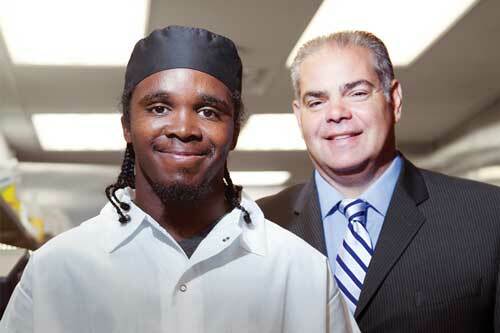 Meet Jeffrey, who landed a job at the Capital Grille in Providence working 10 hours a week. He was quickly promoted to full-time, and received a raise. Jeffrey uses one word to describe the feeling he gets at his job: “Respect.” With the encouragement of the Capital Grille’s General Manager, three other Capital Grilles in Pittsburgh, Indianapolis, Boston have also hired people with developmental disabilities.